This was the first in a number of collaborations between George Hilton and director Giuliano Carnimeo (if one excludes the uncertain input that Carnimeo had in I due figli di Ringo, that is). An exemplary example of the wheels-within-wheels school of scriptwriting, it is typical of their works in being a somewhat rumbustious affair with odd stretches of singular strangeness (such as a particularly odd slaughterhouse set gundown). It also happens to be pacey, well made and hugely enjoyable. 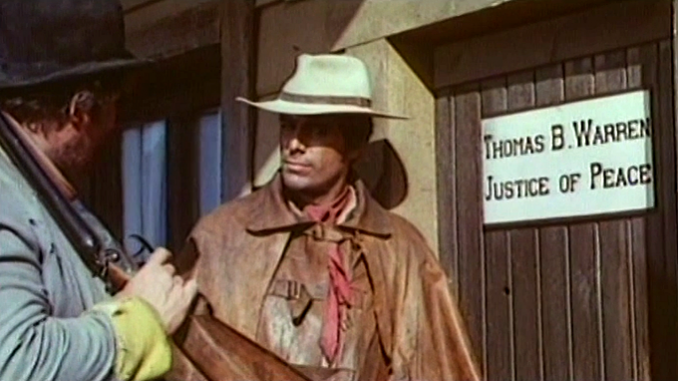 Hilton plays the suave bounty hunter Lord, and Walter Barnes (unrecognizable from sleazebag roles such as in The Big Gundown (La Resa dei conti, 66)) is Bull, his inseparable partner and ‘shadow’. Together they attempt to trace a cache of gold hidden by a dead Texan general, who had squirreled away the loot in order to resurrect the Southern cause. Helping them in their task are the crippled daughter of the dead man (Loni Von Fredl) and her faithful friend Trent (Renato Romano). Hindering them are the nasty town boss Forrester (Carlo Alighiero) and his psycho son, Jason (Horst Frank). Of course, nothing is quite as it seems and by the end of the running time just about everyone has double-crossed everyone else… with the dishonorable exception of our profundity spouting heroes. 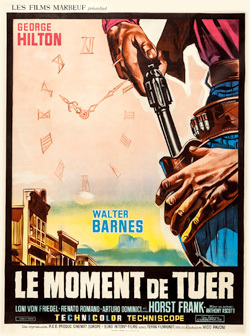 In between the narrative twists and turns there are plentiful shoot outs and fist-fights; indeed, if there is one big problem with the film it is that there is a veritable profusion of these, to the extent that they begin to interfere with the minutiae of the plot. This was a fault that riddled the spaghettis as a whole, and which reached an apotheosis with the comedy westerns which veered towards being ninety minutes of pure acrobatics (and rather dull with it). On the other hand, there is a great Francesco De Masi score (am I one of the only people who thinks that this guy is a tad overrated?) and, best of all, a sensational bit of leftfield acting from the great Horst Frank. This guy goes even further than Nino Castelnuovo in Massacre Time (Tempo di massacro, 66) with his purely nutty dastardliness. Torturing peons, swaggering around his pa’s town blowing away anything or anyone that offends him, this is one unhinged dude – and the film benefits greatly from it. Totally enjoy this film as pure escapism. Walter and George look and act as if they are having a great time making this film and want the audience to join in the fun. Just sit back and watch the non-stop action as our heroes do away with the baddies no matter what the number they have to face. I’m one of the the majority who love Francesco DeMasi and put him right alongside Ennio Morricone as master composers of the genre. When ever I see DeMasi’s name in a list of credits I know the music will be superb.